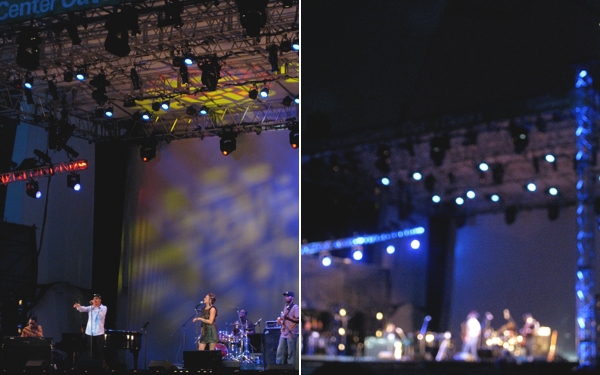 Wandered early in the evening over to Lincoln Center for their free outdoor concert series. Read about yesterday's bands here. Couldn't resist taking a shot like this. 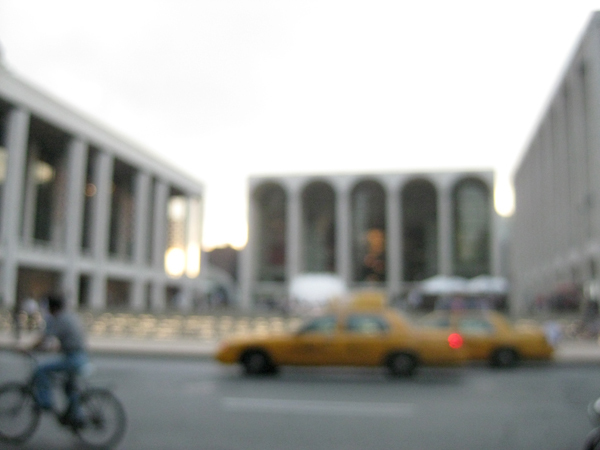 Penchant for bokeh and taxi-cab yellow. 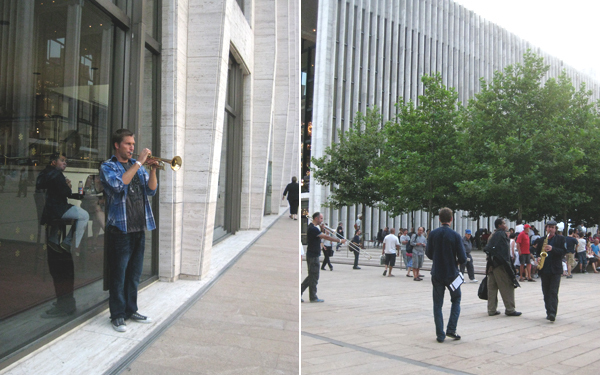 Asphalt Orchestra was a neat concept. Looked like a lot of fun and watching these performances always makes me miss playing in a band. The music played was so complex and really had a lot of depth. I don't think I can even begin to comprehend it, so I will just enjoy the beats and appreciate the mellow but energetic melodies. 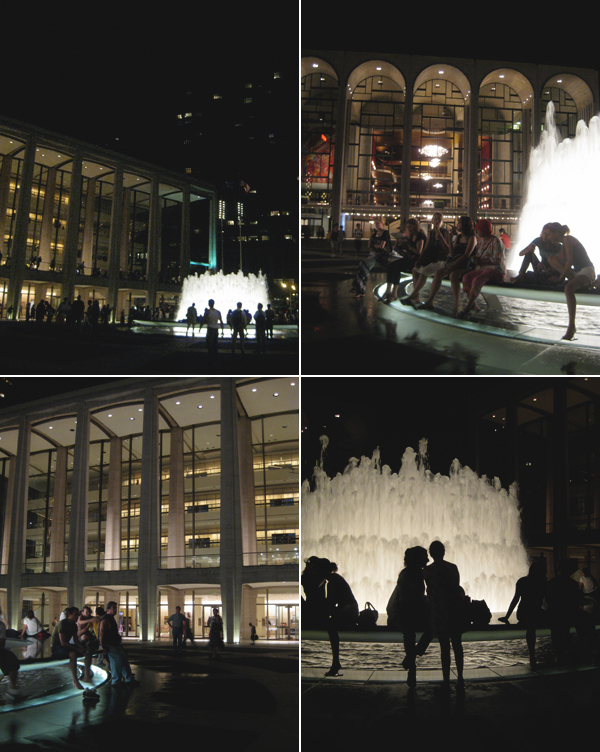 Lincoln Center at night is such a dream. Even in the thick and humid air of last night. There was something about the windows of light, the extra bright fountain area, the silhouette play, and the range of sounds that felt oddly renewing. It really just felt like summer in the city. 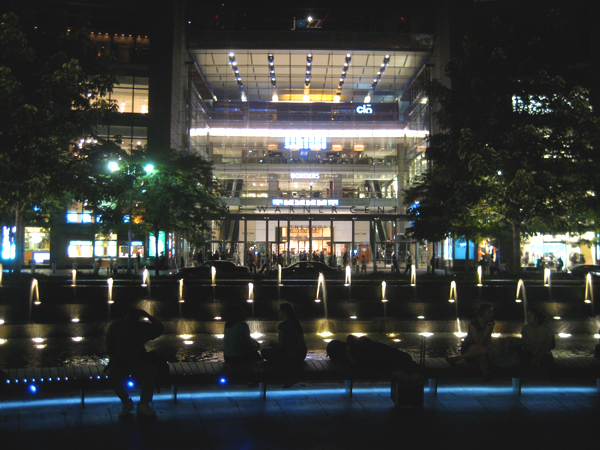 Eating pinkberry on the steps at Columbus Circle and having one of those hyper-alive moments with the fountain water silvered by the lights all around. Looking enviously at the suits emerging from the likes of Per Se and Masa and wondering if I will ever truly be able to afford such luxuries. Not in my youth, that's for sure, and then it won't matter when I'm old. Seems that if there's one thing I've learned in the recent years, it's that life is all about trade-offs. We can't have everything. And being in the best city in the world doesn't matter if you don't have people to share experiences with. Everybody is busy busy these days, or going out to the trendiest clubs and spending more than 3x my rent on bottle service, and all I want to do is sit on these steps and spend all night in deep conversation with good company. That might just be perfect. Things are always more enjoyable when they're cheap/free than when they're super expensive. Looks like you had a great time! I agree with Brian, sometimes the most inexpensive things can be more memorable. Such pretty flowers! It's true - hanging out with good people is better than anything you can buy. The best times I've had are lying in central park with my friends. Food + friends = fun. So far this is probably my favourite post you've written. Very sentimental but in a positive way! :) Love it!